T-Bone slept for almost 9 hours last night. That’s 9 solid hours… Without waking up once. It must be the new pajamas. 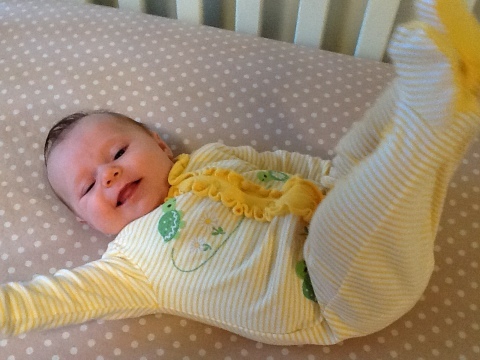 At two and a half months old she has managed to outgrow her 3-month size pajamas, so she and I went shopping on Tuesday. Gymboree came to the rescue with an additional sale on clearance items, so she has 2 new sets of 3-6 month, plus one that my brother’s wife sent when she was born. She also had her first big outing with her Papa (without me) last night. They’d been out for walks together, but this time they had to take the car to Bee’s nephew’s birthday party. I had a previous engagement that I couldn’t get out of, so Bee loaded our sweet little girl (who happened to be screaming mad at the time) into the car and off they went. He said she was a model citizen and they had a good time. Good job, Papa! Maybe the wild birthday party wore her out, too? We all took a turn holding her and she even had a little nap. Such a cutie. Those are some cute pjs. She was an angel last night. She does love her papa! !